Dana Holgorsen and West Virginia are headed for an appearance against Syracuse in the Camping World Bowl. 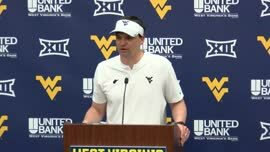 MORGANTOWN, W.Va. — West Virginia is going to Disney World — but not for a championship celebration. The No. 16 Mountaineers (8-3) will play No. 20 Syracuse (9-3) in the Camping World Bowl in Orlando, Fla. on Dec. 28. 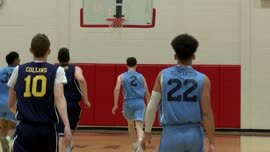 It’s a renewal of an old rivalry that dates back to when both schools were in the Big East, and even well before that when they competed as two of the top independents on the East Coast. The schools faced each other every year from 1955-2012. The last of those meetings was in the 2012 Pinstripe Bowl, which the Orange won 38-14. Syracuse is making its first bowl appearance since 2013, while West Virginia is bowling for the fifth straight season. It’s the second time in three years that West Virginia has been sent to Orlando’s undercard to the Citrus Bowl. The Mountaineers lost to Miami in 2016 when the game was known as the Russell Athletic Bowl. “We’re excited to be going to the Camping World Bowl once again. 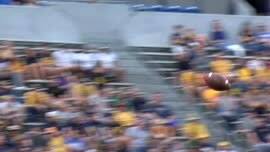 From a proximity point of view, it’s spectacular, it’s perfect for us,” said WVU coach Dana Holgorsen. “It’s a great old Big East matchup with Syracuse. I know our fan base will be excited about rekindling some old memories. There shouldn’t be a lack of fireworks, and not just due the proximity to Disney’s nightly displays. West Virginia and Syracuse are two of the nation’s most explosive offenses — two of only 12 teams in college football averaging more than 40 points per game. “It sounds like a Big 12 school to me, that just happens to be in the ACC,” Holgorsen said. 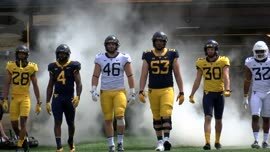 The bowl destination is a bit of a letdown for fans who were hoping to see West Virginia make its first-ever appearance in the Alamo Bowl, which is slotted to the Big 12’s top team to not reach the College Football Playoff or the Sugar Bowl. Instead, that bid went to Iowa State, which dominated the Mountaineers 30-14 in their head-to-head meeting on Oct. 13. West Virginia is trying to end its year on a positive note after a disappointing finish to the regular season. 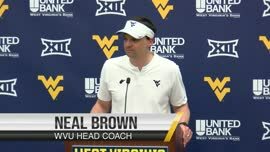 The Mountaineers missed out on a Big 12 championship game appearance by closing the regular season with back-to-back one-possession losses to Oklahoma State and Oklahoma.